This is the recipe I use to take the mystery out of jam-making at my cookery school. Students are astonished and delighted to discover that they can make yummy jam in just a few minutes. It's also worth noting that you can make as much or as little jam as you wish - if you have just a punnet of fruit, weigh it, then simply add the same amount of sugar as fruit. To really dazzle friends, pop a few scones in the oven before you start - the jam will be cooked by the time the scones are cool enough to eat. Wash and dry the jars, then sterilise. Heat the sugar in the oven along with the jars for 5-10 minutes. Put the raspberries into a wide stainless-steel pan and cook for 3-4 minutes until the juices begin to run, then add the hot sugar and stir over a gentle heat until dissolved. Increase the heat and boil for 5 minutes, stirring frequently until at setting point. To test, place 1 teaspoon jam on a cold plate and leave for a few minutes in a cool place; it should wrinkle when pressed with a finger. If not, cook for a little longer until it reaches setting point. Remove the pan from the heat immediately and add the cassis, if using. Skim off any froth and carefully pour the jam into the sterilised jars. Cover immediately. 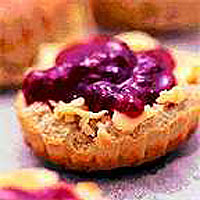 Store the jam in a cool, dry cupboard or larder away from direct light, and then feel great every time you look at it.